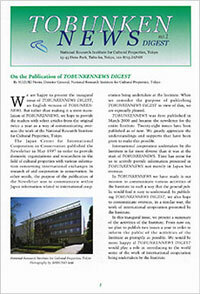 The inaugural issue of TOBUNKENNEWS DIGEST has been published. TOBUNKENNEWS DIGEST is the English version of TOBUNKENNEWS. However, rather than being a simple translation of TOBUNKENNEWS (Japanese version), we will make a careful selection of articles to be included so that it may serve as an official bulletin published twice a year by the Institute for overseas readers. 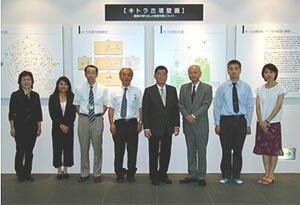 Just as the purpose of TOBUNKENNEWS is to communicate to the public the various activities of the Institute in a way that is easy for everyone to understand, in TOBUNKENNEWS DIGEST we will endeavor to communicate to readers overseas, in a similar way, various activities of international cooperation that the Institute promotes. 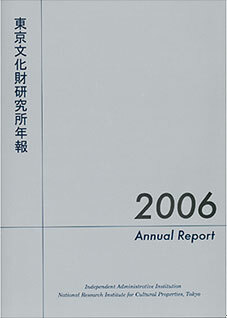 The activities of the Institute in 2006 are summarized in the inaugural issue. From now on, two issues will be published each year in order to communicate the activities of the Institute as promptly as possible. We sincerely hope that TOBUNKENNEWS DIGEST will play a role in communicating a part of the work of international cooperation promoted by the Institute. The Annual Report for the fiscal year 2006 and the Profile for 2007 have been published. The Annual Report is published each year to introduce comprehensively the various activities executed by the Institute during the previous year. The Profile, on the other hand, introduces in English and Japanese the various activities that the Institute plans to execute during the present fiscal year. Materials are presented visually to make it easier to understand these activities. The Annual Report and Profile are distributed to national and prefectural museums, galleries and libraries of universities that offer studies in fields related to cultural properties. They are also available in PDF file from the Institute’s website. 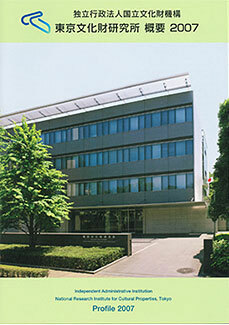 The Profile, in particular, is also distributed to the public along with TOBUNKENNEWS at Kuroda Memorial Hall and the Institute. 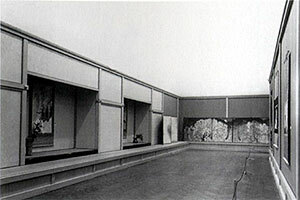 Exhibition of Japanese Art held at Rome in 1930 Many works by such leading Japanese painters as Yokoyama Taikan were exhibited in tokonoma (alcoves) constructed at the exhibition site. As a part of its research project “Comprehensive Research on Modern and Contemporary Art,” the Department of Research Programming is making preparations toward the publication of A Study of Art Exhibitions of the Showa Era (Pre-World War II) in 2008. This publication is a collection of articles on major art exhibitions held during the pre- World War Showa era, the data of whose exhibits have been published in 2006 in the Catalogue of Exhibits from Art Exhibitions of the Showa Era (Pre-World War II volume). Editorial meetings were held twice, in September 2006 and May 2007, and arrangements were made with prospective authors. Consequently, a total of 29 authors, most of whom are young researchers, have been asked to contribute articles from the point of view of their respective disciplines. 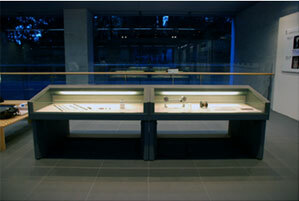 At the core are the trends of exhibitions and art groups. But various genres such as paintings and sculpture, prints, photographs, craft art as well as themes particular to pre-World War II Showa era, such as proletariat art and war art, will be covered. Thanks to significant development in research in recent years, it appears that this publication will be a substantial study both quantitatively and qualitatively. We plan to hold workshops by the authors in order to exchange opinions so that the publication may be of high quality. Researchers of the Department of Intangible Cultural Heritage were asked by the Dramatic Arts Center of Iran to give lectures at the International Seminar for Traditional and Ritual Theatre during the Iranian Artist’s Forum (August 20-22, Tehran). 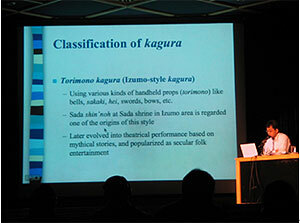 Ijima Mitsuru spoke on “Bunraku: Traditional Japanese Puppet Theatre” and Hyoki Satoru on “Folk Performing Arts and Traditional Festivals in Japan.” They also attended an informal discussion at the Iranian Academy of the Arts and exchanged opinions on such matters as future cooperation in research. The Seminar was held prior to the 13th Tehran International Ritual-Traditional Theatre Festival (August 23-28). 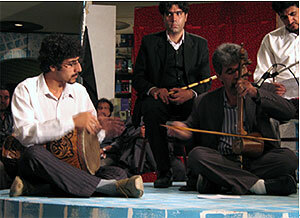 During the festival, various performing arts were presented at many places in Tehran by players from different places, mainly from Iran and neighboring countries. Various performing arts of the Middle East that cannot be seen by foreigners were presented. In this sense, too, it was very meaningful. The 3rd International Steering Committee Meeting of the “Preservation of the Buddhist Monastery of Ajina Tepa, Tajikisitan” funded by UNESCO/Japanese Funds -in-Trust was held on 28 August. The project aims at preserving the Buddhist Monastery of Ajina Tepa, a building complex of earthen structures constructed with pisé or bricks. The Japan Center for International Cooperation in Conservation has participated in this project since 2005 and conducted archaeological investigation, such as sounding for identification of the extent of the site, and cleaning of debris at the site. In several expert meetings and the International Steering Committee Meeting the future direction of the project was discussed, based on the working activities conducted so far and the present state of the site. Several points for improvement regarding the preservation of the earthen wall were pointed out and will be examined further. Installation of a shelter for the protection of a stupa was abandoned and covering the stupa with mud plaster was debated instead. Tajikistan authorities expressed their appreciation for activities conducted by Japanese experts and requested the continuation of the work. In response to this request, the Japan Center for International Cooperation in Conservation hopes to cooperate in the archaeological work that should be carried out prior to the preservation of the site. 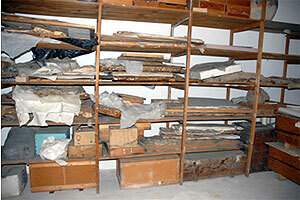 Conditions of mural pieces which were detached during the USSR period; storage room of the National Museum of Antiquities, Tajikistan. 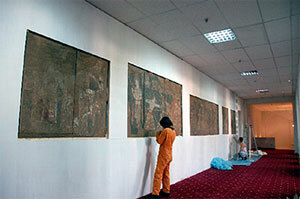 In situ condition survey of murals from Penjikent at the National Museum of Antiquities, Tajikistan. Preliminary condition survey of mural painting pieces which are currently stored at the National Museum of Antiquities, Tajikistan took place between 23rd and 30th August in a framework of the “Cooperation Project for the Conservation of Cultural Heritage in West Asia.” In Tajikistan, most of the conservation activities were initiated by Russian conservators until 1991. However, since the dissolution of USSR, major issues of Tajikistan’s conservation have been related to lack of human and monetary resources for research and conservation. Furthermore, since most of the conservation methods and techniques are based on those of the Russians, which are not up to the current methods in conservation, urgent technical support from foreign countries such as Japan and Europe is required. The National Museum of Antiquities, Tajikistan owns outstanding mural paintings from Penjikent, Shafristan and other sites depicted by Sogdians who are known as active merchants of the 6-8th centuries AD. In its storages, some hundreds of detached paintings from archaeological sites have been piled and left for over 40 years without any proper treatment. Especially after USSR’s dissolution, all excavated/detached pieces have been left untreated within Tajikistan. These detached paintings reflect an ethical issue, above all, against such thoughtless measure of ‘detachment’ from their original locations as well as technical issues such as the darkening of synthetic polymers that were used as consolidants in the past. In order to protect and preserve such important murals, urgent support is required in the training of local conservators with expertises in the field of conservation. 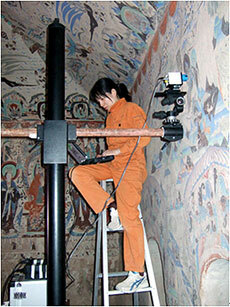 A great number of mural paintings remain at the Dunhuang Mogao Grottoes. However, those that can be observed today with the naked eye have deteriorated significantly due to the passage of time. Compared with their condition at the time of their creation more than one thousand years ago, these paintings have changed greatly – colors have changed or faded and pigments have become detached and lost. Conservation of these paintings involves the elucidation of the mechanism of their deterioration and the treatment of the paintings to prevent further deterioration. Determining the original methods and materials as well as the factors that led to their present condition is essential in considering the method of their conservation. At the same time, it is also quite important in reviving the value of the paintings. Only when both are fulfilled can it be said that cultural property is truly protected. 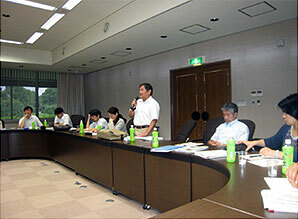 In the Japan-China joint research project, comprehensive study of these paintings is conducted. 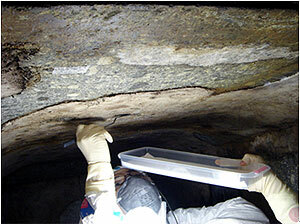 This includes observation by normal light, raking light, infrared ray and ultraviolet fluorescence photography; detailed non-destructive analysis using digital microscope, portable x-ray fluorescence and Raman spectroscope; detailed analysis of the techniques and materials as well as the condition of deterioration by micro-sampling; and detailed observation of the condition of deterioration by conservation specialists. Through such a study, the use of a great amount of organic coloring materials and the special condition of the deterioration of the mural paintings of Cave 285 (first half of the 6th century), which were not known until now, are beginning to be clarified. Moreover, radioactive carbon (14C) dating of the stone chamber and provenance study of the lead-based pigment by lead isotope ratio analysis are conducted in an attempt to do research with a large area of the Silk Road in view.